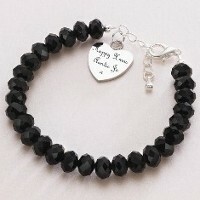 Personalised bracelets with engraving make wonderful gifts for men and women alike and we offer free delivery to anywhere within the UK! Whether you like the idea of a fashionable silver bead stacking bracelet or a more traditional charm bracelet we have designs to suit all tastes and occasions. 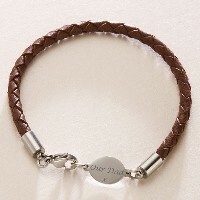 We also make personalised leather bracelets in a range of colours. Also see our range of Necklaces with Engraving and Photo Jewellery with Engraving which included Bracelets with photo charms.